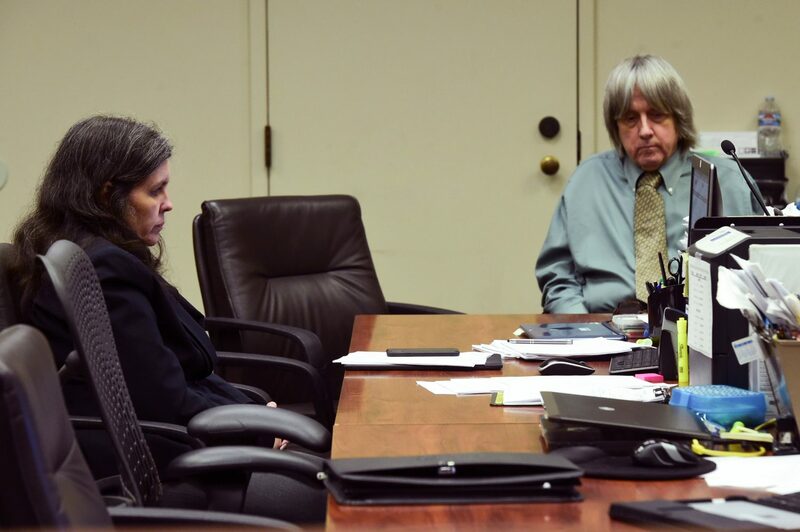 LOS ANGELES (Reuters) – A Southern California couple who pleaded guilty to charges stemming from grim, headline-making accusations they beat, starved and shackled their 13 children in the family’s home were due to be sentenced on Friday to 25 years to life in prison. David Turpin, 57, and his wife Louise Turpin, 50, agreed to the long prison terms as part of an agreement with Riverside County prosecutors that saw them plead guilty in February to torture, child abuse and false imprisonment charges. The plea deal, which calls for additional charges against both spouses to be dropped, means they will spend the rest of their lives in prison unless granted parole after a mininum of 25 years behind bars. The sentencing marks the culmination of a criminal case that has convulsed the community of Perris, California, some 70 miles (113 km) east of Los Angeles, since an emaciated 17-year-old girl climbed out of a window of the family’s home and called 911. Deputies who raided the residence found the girl&rsquo;s 12 brothers and sisters, ranging in age from 2 to 29, trapped inside the darkened, foul-smelling house, some of them chained to beds. The siblings, found to be suffering from malnourishment, muscle wasting, stunted growth and other signs of severe abuse, were taken into protective custody, and the parents were arrested. Prosecutors said the victims had been denied proper nutrition, basic hygiene and medical care and were harshly punished for perceived infractions such as wasting water by washing their hands above the wrist. The couple also were accused of taunting their children with pies and other food that they were forbidden to eat. David Turpin&rsquo;s parents, James and Betty Turpin of West Virginia, have said their son and daughter-in-law were a deeply religious couple who home-schooled their children and required them to memorize Bible scripture. The children, whose ages now range from 3 to 30, are in the care of child and adult protection agencies. PARIS (Reuters) – The French interior minister warned on Friday that violence could flare up on the 23rd Saturday of yellow-vest protests, as authorities banned marches around the fire-gutted Notre-Dame cathedral. The warning comes after weeks of relative calm, with the marches attracting declining numbers as yellow-vest protesters waited for President Emmanuel Macron’s expected response to their various demands which include lower taxes and more government services. Christophe Castaner, the interior minister, said domestic intelligence services had informed him of a potential return of rioters intent on wreaking havoc in Paris, Toulouse, Montpellier and Bordeaux, in a repeat of violent protests on March 16. That day, hooded gangs ransacked stores on Paris’s famed Champs-Elysees avenue, set fire to a bank and forced Macron to cut short a ski trip in the Pyrenees. Castaner said that planned marches that would have come near the medieval church on the central island on the Seine river had been banned, while one march from Saint-Denis, north of Paris, to Jussieu university on the Left Bank, had been authorized. The catastrophic fire at Notre-Dame cathedral on Monday, one of France’s best-loved monuments, prompted an outpouring of national sorrow and a rush by rich families and corporations to pledge around 1 billion euro ($1.12 billion)for its reconstruction. 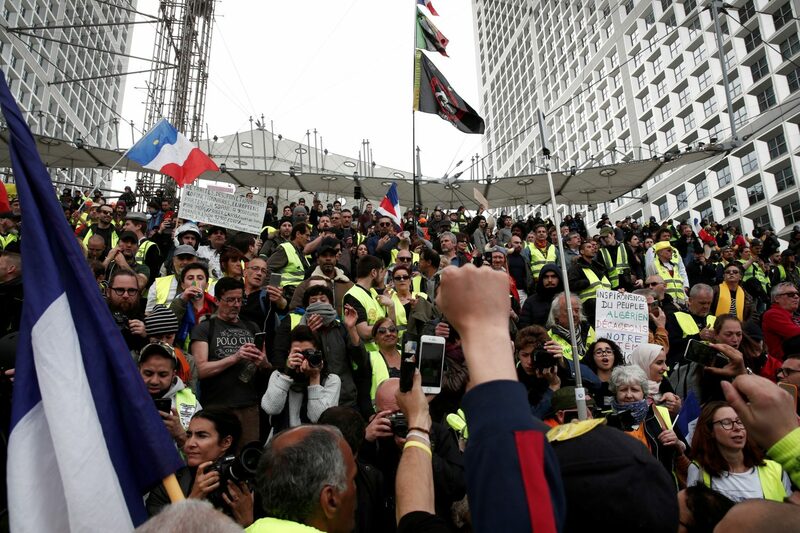 That has angered some yellow-vest protesters, who have expressed disgust at the fact their five-month-old movement, which started as an anti-fuel tax protest last year, has not received the same generous donations by France’s elite. “I’m sorry, and with all due respect to our heritage, but I am just taken aback by these astronomic amounts!” Ingrid Levavasseur, one of the yellow vests’ most recognizable public faces, said on her Facebook page. “After five months on the streets, this is totally at odds with what we have seen,” she said. The yellow vest movement poses the biggest challenge so far to Macron’s authority two years into his presidency. The French leader was due to unveil policies to quell the grassroot movement on Monday, before the blaze at Notre-Dame forced him to cancel the speech. He has yet to set a new date for the announcements. 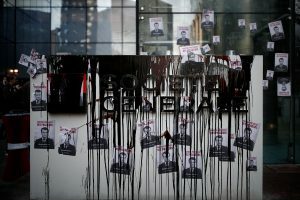 PARIS (Reuters) – Climate activists blocked thousands of employees from entering the headquarters of French bank Societe Generale, state-run utility EDF and oil giant Total on Friday, environmental group Greenpeace said. Greenpeace said it was protesting against company links to the oil and gas industry, which it calls a driving force in global warming. 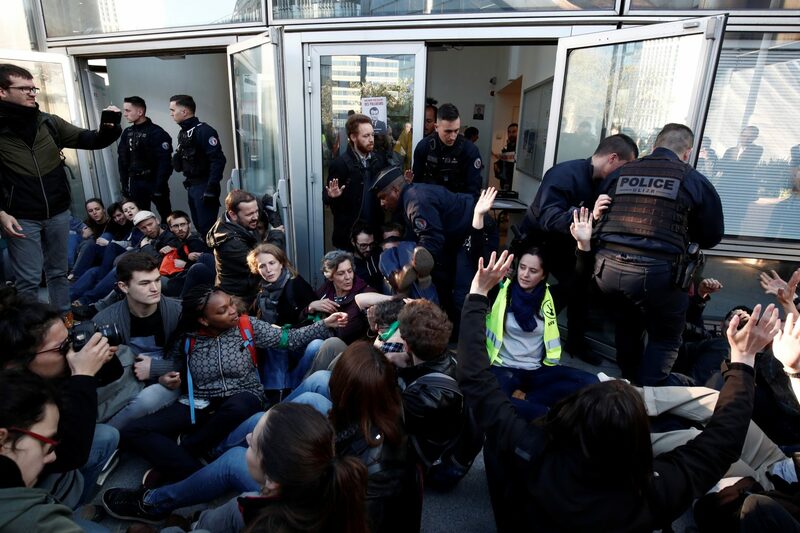 Activists also obstructed the entrance to the environment ministry near La Defense business district. Protesters plastered giant posters of President Emmanuel Macron carrying the slogan “Macron, President of Polluters” and a banner reading “Scene of Climate Crime” on the glass facade of Societe Generale, Reuters TV images showed. Police pepper-sprayed one group blocking the bank’s main entrance in a sit-down protest. Some demonstrators taped themselves together while others cuffed themselves with plastic ties to metal poles to make it harder for police to dislodge them. Employees in business suits milled around outside their offices. “I just want to get inside and on with my work,” one frustrated bank employee said. Greenpeace and action group Les Amis de la Terre (Friends of the Earth) have previously criticized Societe Generale for its role in financing oil and gas projects, in particular the Rio Grande LNG gas project in the United States. A Societe Generale spokesman declined to comment. A spokesman for EDF, which relies heavily on nuclear and hydropower plants to generate electricity, said 96 percent of its power was carbon dioxide-free. He said EDF was committed to curbing its total carbon footprint by 40 percent by 2030. A Total spokeswoman said two senior company executives had held talks with representatives of Greenpeace and Les Amis de la Terre. At an oil industry summit in Paris on Friday, Total Chief Executive Patrick Pouyanne acknowledged the climate change protests. “Many people are demonstrating in Paris and are asking for more action. We all know it is not so easy because the population’s primary request is for access to more energy, affordable energy and it has to be clean,” he said. He added that Total was trying to address climate change by improving the efficiency of its operations, growing its natural gas business and developing an electricity business based on low-carbon gas and renewables. He also said Total had increased its output to 2.95 million barrels of oil equivalent per day this year, passing its 2018 record, aided by increased production in Australia, Angola, Nigeria and Russia. Friday’s protest echoed a series by the Extinction Rebellion group of climate-change campaigners in London this week that have caused transport snarl-ups in the British capital. Teenage demonstrators staged an emotional protest, weeping and singing, at political inaction on climate change near London’s Heathrow Airport on Friday. (Reuters) – A second wave of tornadoes and thunderstorms to hit the U.S. South and Midwest this week turned deadly on Thursday with three people reported killed, as the storms pushed eastward on Friday, officials and media accounts said. 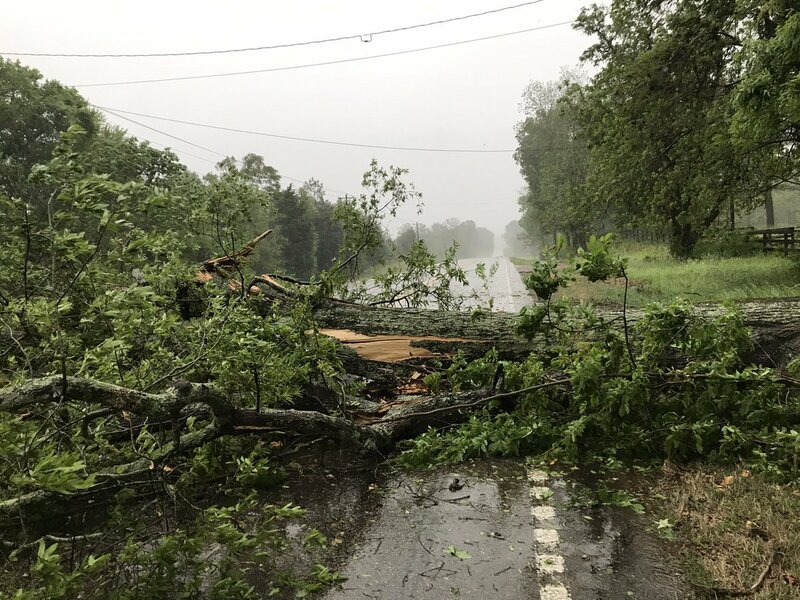 One person was killed after a tree fell on his vehicle in Neshoba County, Mississippi, Thursday afternoon, the local paper, the Neshoba Democrat, reported. A second death was reported in St. Clair County, Mississippi, after a tree fell on a home, late Thursday, according to AccuWeather. A third death was reported late Thursday in the Wattsville community, north of Pell City, Alabama, the National Weather Service (NWS) reported, after a tree fell on a home. The deaths come in the wake of at least five people, including three children, who were killed last weekend in a storm system that drove more than three dozen tornadoes across the U.S. South. Communities in central Texas and western Louisiana, already hit by flash floods and twisters in the first round last weekend, were hit once more by high winds, twisters, egg-sized hail and intense rain Thursday and Friday, according to AccuWeather and the NWS. In the latest storm system, multiple possible tornadoes hit southwest and central Mississippi Thursday night and early Friday, the NWS said, but the damage will have to be surveyed before confirmation of twisters. “We’re still under some severe storm warnings, tornado watches and flood warnings into this morning and the afternoon across a broad swipe of the U.S.,” said NWS meteorologist Bob Oravec early Friday. “The severe thunderstorms will impact the deep South and southeastern U.S., through Georgia and the Florida panhandle, before it heads up the Atlantic Coast,” he said. Flash flooding could remain a threat in Maine, New Hampshire and Massachusetts on Saturday, the weather service said. The storm system will lose much of its punch late in the weekend, but the East Coast should expect a soggy Easter, Oravec said. Power outages were reported early Friday in Texas, Mississippi, Alabama and Tennessee, affecting a total of about 91,800 homes and businesses, according to the tracking site PowerOutage.Us. 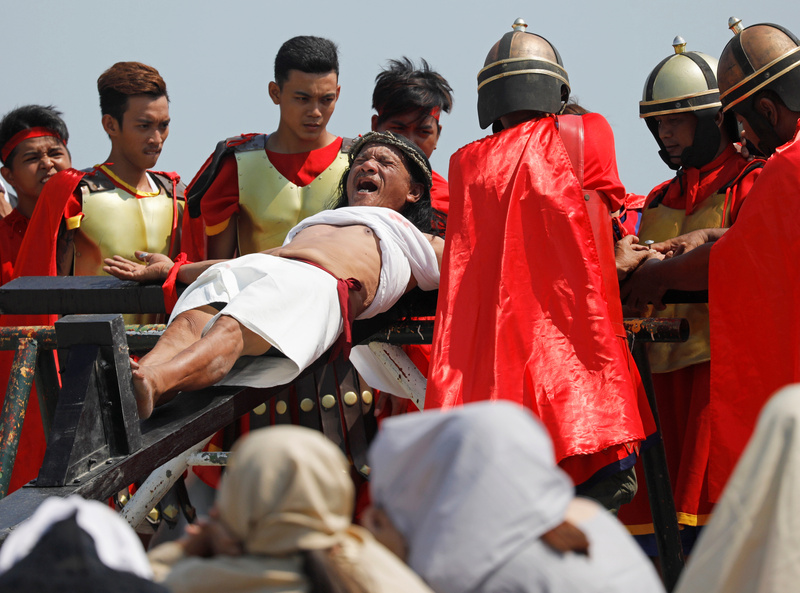 CUTUD, Philippines (Reuters) – Hundreds of tourists watched in shock as actors dressed as Roman soldiers hammered four-inch nails through the hands and feet of a Filipino into a wooden cross for the 33rd time in a Good Friday re-enactment of Jesus Christ’s crucifixion. 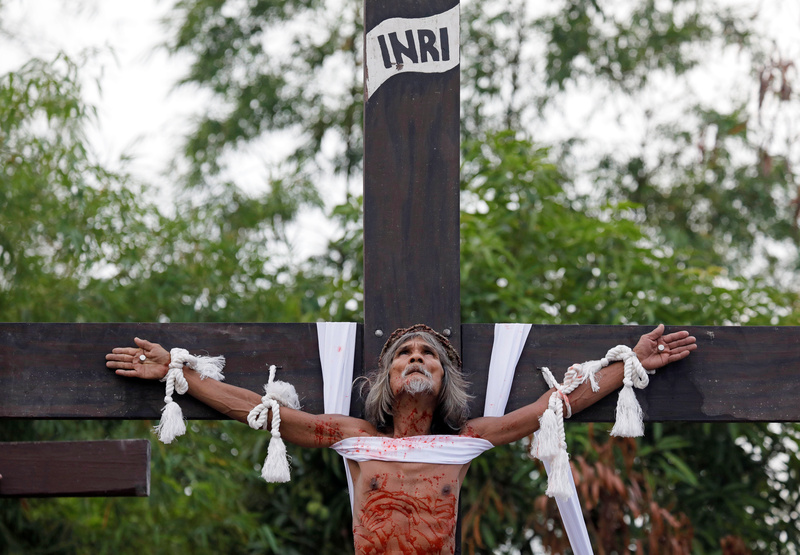 The gory display of devotion, which the Roman Catholic Church in the Philippines looks down upon, draws tourists to the province of Pampanga, north of the capital, year after year as barefoot penitents also whip themselves as a form of penance. “I thought they wouldn’t be nailed but they were really nailed, and it was for me a great event to see it live,” said German tourist Johann Tenken. Devotees, including 58-year old Ruben Enaje who has performed the act 33 times, believe their penance will wash away their sins, cure illness and lead to blessings. 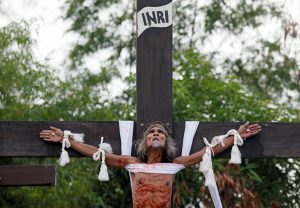 Enaje was among the four people who were nailed to crosses in the village, including a woman taking part for the 17th time. 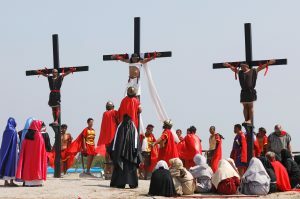 The crucifixions were the most extreme display of faith this mainly Catholic country, where millions were praying and fasting ahead of the Easter weekend. 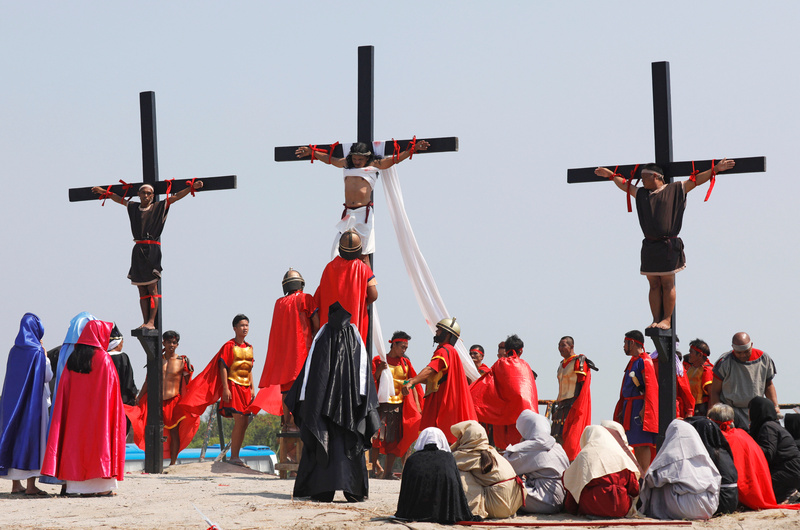 Five other Filipinos were nailed to crosses in two other villages in Pampanga. “At the end of the day, you have to respect the people doing this because that’s devotion,” said Filipino tourist Bianca Yao. Christians believe Jesus died on the cross to pay for the sins of humanity and rose from the dead two days later. WASHINGTON (Reuters) – Congressional Democrats on Friday demanded to see all of U.S. Special Counsel Robert Mueller’s evidence from his inquiry into Russian interference in the 2016 election, as they consider how to use the probe’s findings against President Donald Trump. The report provided extensive details on Trump’s efforts to thwart Mueller’s Russia investigation, giving Democrats plenty of political ammunition against the Republican president but no consensus on how to use it. 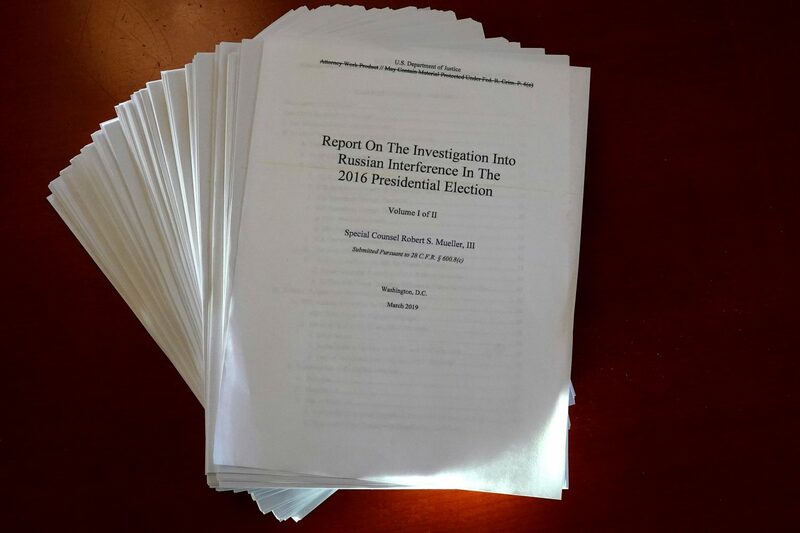 The 448-page report painted a clear picture of how Trump had tried to hinder the probe but did not conclude that he had committed the crime of obstruction of justice, although it did not exonerate him. The report blacked out details about secret grand jury information, U.S. intelligence gathering and active criminal cases as well as potentially damaging information about peripheral players who were not charged. Half a dozen former Trump aides were charged by Mueller’s office or convicted of crimes during the 22-month-long investigation. 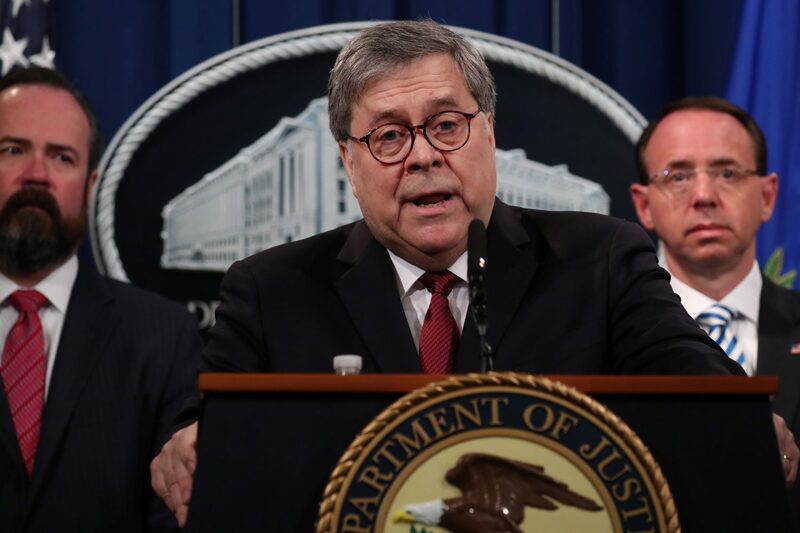 The Democrats’ subpoena gives U.S. Attorney General William Barr until May 1 to produce the materials requested. Democratic leaders played down talk of impeachment just 18 months before the 2020 presidential election, even as some prominent members of the party’s progressive wing, most notably U.S. Representative Alexandria Ocasio-Cortez, promised to push the idea. Former FBI director Mueller also concluded there was not enough evidence to establish that Trump’s campaign engaged in a criminal conspiracy with Moscow to sway the 2016 election, a finding that has been was known since late March when Barr released a summary of what he described as Mueller’s principle conclusions. 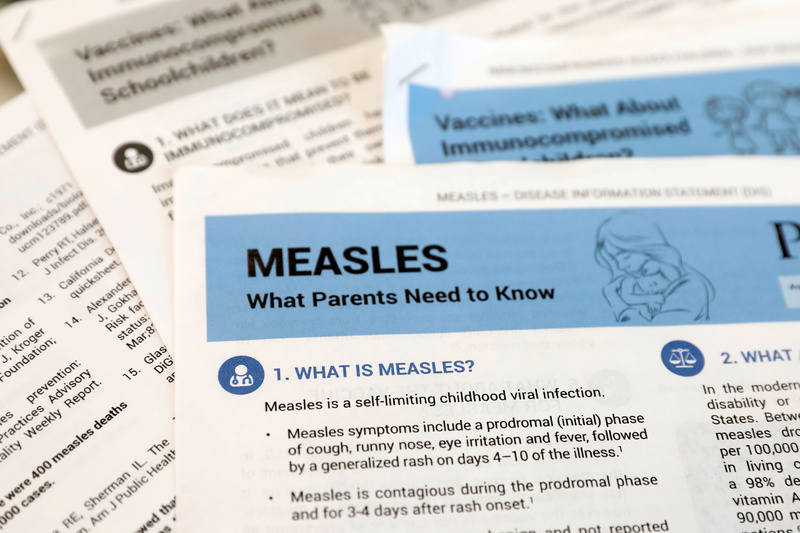 NEW YORK (Reuters) – A Brooklyn judge on Thursday ruled against a group of parents who challenged New York City’s recently imposed mandatory measles vaccination order, rejecting their arguments that the city’s public health authority exceeded its authority. The New York outbreaks are part of a larger resurgence of measles across the country, with at least 555 cases confirmed in 20 states, according to the U.S. Centers for Disease Control and Prevention. Health experts say the virus, which can cause severe complications and even death, has spread mostly among school-age children whose parents declined to get them vaccinated. Most profess philosophical or religious reasons or cite concerns – debunked by medical science – that the three-way measles-mumps-rubella (MMR) vaccine may cause autism. Krakow later told Reuters he was reviewing the judge’s dismissal of the case – brought under special proceedings for the appeal of administrative actions – to determine how his clients might respond. (Reuters) – There are several aspects of Special Counsel Robert Mueller’s investigation into Russia’s role in the 2016 U.S. election campaign that were not previously known until the release of his report on Thursday. U.S. President Donald Trump believed the appointment of a special counsel to take over an active federal investigation would spell the end of his presidency, according to Mueller’s report. Trump asked Sessions, whom he had berated for months for recusing himself from the investigation of Russian interference in the election: “How could you let this happen, Jeff?” and told Sessions he had let him down. Trump told Sessions he should resign, and Sessions agreed to do so. When Sessions delivered his resignation letter to Trump the following day, Trump put the letter in his pocket but said he wanted Sessions to stay on the job. That alarmed chief of staff Reince Priebus and senior advisor Steve Bannon, who worried Trump would use the letter to control the Department of Justice, and they tried to return it to Sessions. Mueller tried for more than a year to interview Trump, but in the end, Trump refused. Trump provided written answers on some Russia-related topics but did not agree to answer questions about possible obstruction of justice or events that took place during the presidential transition. Trump tried to get Mueller fired in June 2017, shortly after he was appointed, according to the 448-page report. Trump called then-White House counsel Don McGahn twice and directed him to order Deputy Attorney General Rod Rosenstein to fire Mueller on the grounds that he had conflicts of interest. McGahn felt “trapped,” but did not carry out the order, deciding that he would rather resign, Mueller said. Other White House advisers later talked McGahn out of resigning, and Trump did not follow up to ask whether McGahn had fulfilled his directive. Trump pressured McGahn to deny that these events took place when they surfaced in news accounts in January 2018, but McGahn refused, according to Mueller’s report, some of which was blacked out to protect some sensitive information. Trump also enlisted his former campaign manager, Corey Lewandowksi, to try to narrow the investigation’s scope. The report said Trump asked Lewandowski in June 2017 to tell Sessions that he should publicly announce that the Russia probe was “very unfair” to the president, say Trump had done nothing wrong, and limit Mueller’s probe into interference in future elections, not the one that had put him in the White House. A month later, Trump asked Lewandowski about the status of his request and Lewandowski assured Trump he would deliver the message soon. Trump then publicly criticized Sessions in a New York Times interview and a series of Twitter messages. Mueller says Lewandowski did not want to deliver the message to Sessions, so he asked senior White House official Rick Dearborn to speak to him. Dearborn also did not want to carry out the task. Ultimately, the message never reached Sessions. Mueller found that campaign chairman Paul Manafort’s efforts to work with his former business partners in Ukraine were greater than previously known, as he tried to use his insider status on the campaign to collect on debts owed for his past work by Oleg Deripaska, an oligarch who is close to Russian President Vladimir Putin. Shortly after he joined the campaign in the spring of 2016, Manafort directed his deputy Rick Gates to share internal polling data and other campaign materials with Konstantin Kilimnik, a former Ukrainian business partner, with the understanding that it would get passed on to Deripaska, the report said. During an August 2016 meeting in New York, Manafort told Kilimnik about the campaign’s efforts to win the battleground states of Michigan, Pennsylvania, Wisconsin and Minnesota, the report said. Trump ended up winning three of those states in the November election. Manafort worked with his Ukrainian allies until the spring of 2018, after he had been indicted by Mueller, to promote a peace plan that would have split the country in two. These efforts did not constitute coordination between the campaign and Russian efforts to disrupt the election, Mueller found. Manafort urged Gates not to plead guilty after they were both indicted by Mueller, apparently believing that they would be pardoned by the president if they did not cooperate with investigators. Trump’s numerous sympathetic statements before and during Manafort’s criminal trial could be interpreted as an effort to sway the outcome, but they also could be interpreted as a sign that he genuinely felt sorry for Manafort, Mueller said. Relations between Washington and Moscow had deteriorated under two previous administrations and the United States had imposed sanctions on Russia. Following Trump’s election victory, Russian financier Kirill Dmitriev worked on a proposal to improve ties with Rick Gerson, a hedge fund manager who is friends with Trump son-in-law Jared Kushner. Dmitriev runs Russia’s sovereign wealth fund and reports directly to Putin. Gerson gave the plan to Kushner before Trump was sworn in, Mueller’s report said, and Kushner gave copies to Bannon and then-Secretary of State Rex Tillerson. Gerson told Mueller’s team that he acted as an intermediary between Trump and Russia on his own initiative, not at the request of Trump’s aides. The economic assessment of the U.S.-Mexico-Canada Agreement, released on Thursday, said the trade deal would increase U.S. real gross domestic product by 0.35 percent, or $68.5 billion, on an annual basis and add 176,000 U.S. jobs, while raising U.S. exports. The report’s estimates are for year six of the trade deal, once it is fully implemented. Auto industry employment would rise by 30,000 jobs for parts and engine production, but U.S. vehicle production would decline in and U.S. vehicle consumption would be reduced by 140,000 units because of higher prices, or 1.25 percent of 2017 sales, the report said. The report may give ammunition to opponents of the deal. The leaders of the three countries approved the deal last year, but it still must be approved by the U.S. Congress. 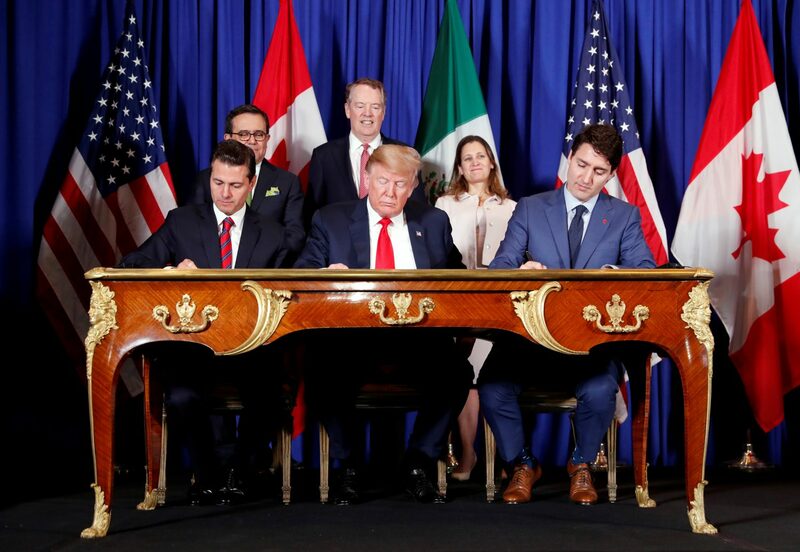 The deal is a replacement for the more than two-decade-old North American Free Trade Agreement. The auto industry had been a key focus of the deal for the Trump administration. The report also found that 1,500 U.S. vehicle manufacturing jobs would be lost and the price of new U.S. vehicles would rise from 0.4 percent for pickup trucks to 1.6 percent for small cars. Some automakers may decide “not to offer vehicles that would be too expensive to bring into compliance, which would ultimately decrease consumer choice,” the report said. (Reuters) – Uber Technologies Inc said it was rolling out new safety features to help riders avoid fake rideshare drivers, two weeks after the murder of a college student who got into her killer’s car mistakenly believing it was her ride. The features include steps to identify the right car and a push notification to remind riders of the “Check Your Ride” steps just before their car arrives, the ride-hailing company said in a blog on Thursday. The features will go live in Columbia and South Carolina on Thursday and will roll out across the United States within a few days. The 21-year old victim Samantha Josephson was a South Carolina university student. 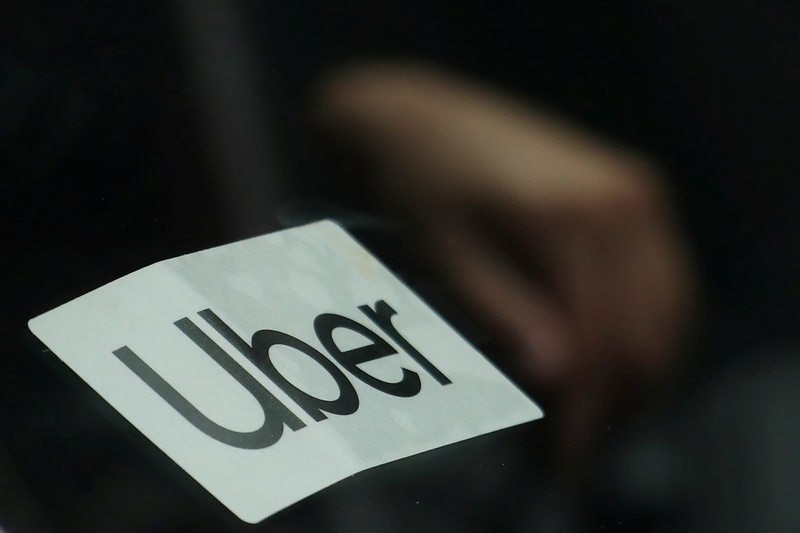 Uber had in July 2017 launched a public awareness campaign against scams and how riders can avoid getting into the wrong car, suggesting that they check the app to ensure that the car matches the one that they booked. The company is also planning to launch a new tool for universities to provide service for students at odd hours when other options are limited. The pilot program will start with the University of South Carolina, while other universities can get themselves enrolled. “We’re also launching an awareness campaign on social media, and we’re placing ads in college newspapers and on billboards near entertainment districts across the country to educate students about these steps,” Uber said.